No-one will ever forget the impact Guy Ipoua made during the Conference Play-off final against Halifax at the Walkers Stadium on May 20th, 2006. I can still see him shouting at Andy Williams down the touchline as he was desperate to get onto the pitch as a substitute. Who can forget his bullet header rocketing into the back of the net for the equaliser? Then after Ryan Green had scored the winning goal the Cameroonian retained the ball near the corner flag to run down the clock. Next came the celebrations – and what scenes they were! Guy Ipoua was born on 14th January 1976 in Douala but left his native country with his family leaving for Strasbourg in France when he was four years of age. As a 16-year old he joined AS Nancy but teamed up with his elder brother Samuel at Torino when he was on loan from Inter Milan. Guy found it difficult to settle at a string of European clubs including Athletico Madrid, Sevilla, Alicante, Ecija Balompie and Novelda but decided to relocate to the UK after his brother picked up international honours with Cameroon who had featured in the 1998 World Cup. A three-week trial at Crystal Palace ended without a contract offer, however, Ian Holloway from Bristol Rovers stepped in. Guy went on to make 24 league appearances that term, scoring on three occasions, but was released in the summer. Guy made national headlines whilst with Scunthorpe, scoring seven goals in a week. A hat-trick against Hartlepool and then another four secured a 6-0 win at Mansfield. His next move was to Gillingham after Peter Taylor agreed a £25,000 transfer fee, otherwise he could have left for free in the summer under the recently introduced Bosman ruling. However, he had picked up an ankle injury which was treated back in France prior to chalking up 82 appearances for the Gills, scoring 13 times in a two-season spell. In June 2003 Guy turned down an FC Dallas approach from the United States, instead agreeing a deal with Livingston in Scotland, but in a nightmare period only featured once before linking up with Doncaster Rovers. More injuries followed and loan spells at Mansfield and Lincoln failed to re-energize his career. It was the Hereford physiotherapist Wayne Jones, who had worked at Gillingham with Ipoua, who recommended him to the then Bulls boss Graham Turner. Initially the move paid off with goals in each of his first three Conference games, but hamstring and then achilles problems meant he was used chiefly as a substitute thereafter. Indeed, he was later to admit his achilles had been ruptured so badly he really needed an operation, but had refused to go under the knife until Hereford had completed their play-off campaign. Such was his imposing presence his introduction to games certainly made him one of the best ‘impact players’ ever seen at Edgar Street. Guy shone in the Conference play-off semi-final against Morecambe, scoring a dramatic extra-time winner. Then came the final itself, and another brilliant ‘cameo’ performance to ensure Hereford won promotion back to the Football League. After leaving Hereford in the summer of 2006 I managed to stay in contact and often enjoyed working alongside Guy in the commentary box. He claims he always promised Graham Turner he would score the vital goals exactly when they were needed, and insisted he even told the ‘Gaffer’ when to bring him on as a substitute after he had “spotted a weakness” in the opposition! 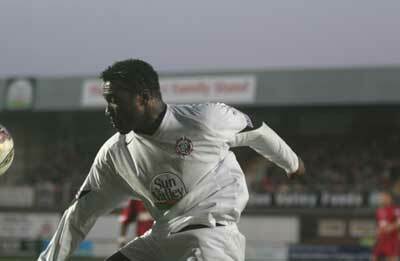 Later playing spells at Forest Green Rovers, Gravesend & Northfleet and Cwmbran Town followed his time at Edgar Street, and he even returned to his native Cameroon for a while featuring for Oryx Douala. Guy worked with Mathieu Manset, Yoan Arquin and Benoit Dalibard when the French players were handed opportunities at Edgar Street, but doesn’t describe himself as an agent. “I’ve fond memories of playing for Hereford. They are memories that will stay with me forever. “I was a powerfully built player but I liked to entertain when I was on the pitch. “I liked to do things differently and sometimes I wasn’t the manager’s favourite, but the supporters loved it. It’s nice to know the fans remember me”. Maybe he could scout for us again? I know just how he felt. I raced down the main stand, down the tunnel and around the ground to behind the goal so I could be there to encourage the ref to call me on to ‘“treat” superman when he went down in the closing minutes. I think Wayne was impressed even if the ref didn’t know why I was there.